High-resolution production. Stellar narration. Genuine, enthusiastic patients. Easy-to-read text. Short, impactful story. Introducing “A Walk in the Park: A Patient's Guide to Sedation Dentistry,” two videos (short and long versions) that presell viewers on the benefits of sedation dentistry. It’s a high-definition video, beautifully edited, with professional narration and real patients. The tone is friendly and empathetic, ending with a gentle nudge to the viewer to make that call. Embed the videos on your website using a short code link. Use the short video to introduce sedation and the longer version to support case acceptance. 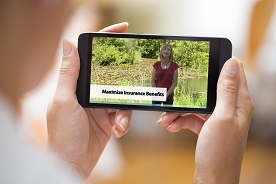 Add them to your practice’s website as embedded video by inserting a single line of code for each video. The license to show the video renews annually. “A Walk in the Park” is an educational primer for general sedation dentistry. The video’s narrator is a trained actress who explains what the viewer can expect during sedation dental treatment in plain, empathetic language. The tone of the video is warm and soothing. The production quality is excellent, capitalizing on natural outdoor light, up-close patient endorsements, and text boxes that repeat key talking points. “A Walk in the Park” unfolds quickly without appearing rushed. The narrator asks and answers the most pressing questions first-time prospects have about sedation dentistry (e.g., “How comfortable is it?”). The video incorporates real patients with testimonies, edited for brevity, that supports the video’s central premise. The longer version discusses the sedation experience and shares testimonies of people, just like your patients, who sing the praises of sedation dentistry and encourage others to get the care they need. Website visitors increasingly expect--even demand--video content. For many, watching video is preferable to reading text during the internet search-and-information-gathering process. “A Walk in the Park” provides visitors a video option for learning the basics of your sedation dentistry services. Notably, the video requires visitors to press a button to watch, rather than playing automatically. Search engines like Google, which prospects use to look for help about their dental fear, favor videos like “A Walk in the Park.” Why? Because the video provides short, direct answers about sedation dentistry. This video increases the chances that your practice will show up in a local sedation dentistry web search. It also acts as a natural gateway for exploring the rest of your website, finding answers, and contacting you. Potential patients want to hear from others that the experience is well worth overcoming obstacles. The outcome is dramatic. The video is often shared with friends and family to prevent buyer’s remorse, justify their purchase and refer. Each video is contained in a line of web code that is sent to you in a post-purchase email. Technical assistance is provided with written instructions (which you can forward to your webmaster). Total running time is 2:47 minutes for the short version and 17:40 for the longer version. The shorter video is also available in Spanish. Additional licenses are $50 annually.